This Will was proved on the thirtieth day of September One thousand eight hundred and thirteen Before the Reverend Jonathen Brigges Clerk Surrogate to the Reverend and Worshipful Joseph Holden Pott Clerk Archdeacon in and throughout the whole Archdeaconry of Saint Alban in the Diocese of London lawfully constituted by the Oath of Joseph King one of the natural and lawful Children of the said Testator Charles King (Sarah King sole Executrix named in the above Will having died intestate without having acted in or taken upon her the Administration of the Effects of the said Testator Charles King) to whom was granted Administration (with the said Will annexed). Allegation and warrant in administration being granted to Joseph King with the Will annexed of Charles King his late Father deceased / Sarah King the Widow and Executrix having died without Intermedling. 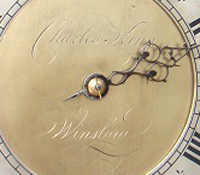 Joseph King appeared and alleged that Charles King Clock and Watchmaker deceased departed this life 5 Jan 1813 having appointed his wife Sarah executrix. She is lately deceased intestate. Joseph King is one of the lawful children of Charles King and prayed Letters of Administration. Joseph King Brazier of Winslow, Richard Wood Shoemaker of Quainton, Samuel Dudley of Winslow auctioner [sic] bound in £200. Joseph King to make an inventory by the last day of March next, accompt by the last day of Sep 1814. Charles King was baptised at Winslow on 7 Aug 1748, son of Charles and Hester King. He married Sarah Bull at Thornborough, 10 Oct 1767. He is generally described as a whitesmith, but in the Posse Comitatus of 1798 he is a clock and watchmaker along with Joseph King, presumably his son. He owned several messuages in Church Walk, one of which (later the Infants School, but the premises were rebuilt after a fire) he sold to Samuel Yeates in 1807. Presumably that was where he lived and had his workshop, but he was initially a tenant of the Deverells of 6 High Street, and may have been their clockmaker. The photo on the right shows the face of a clock he made in the 1770s. His son Joseph (d.1840) was also in business as a brazier, whitesmith and clockmaker at 5 Market Square.